Architect Hani Rashid of Asymptote presents an exhibition called Atmospherics at Phillips de Pury & Company in New York next month. The exhibition will feature geometric forms that Rashid refers to as M-scapes, first produced as a series of digital drawings in 2001. The objects include versions of Rashid's Tula table for design brand Meta (above) and his LQ chandeliers (below). Phillips de Pury & Company is pleased to announce the groundbreaking exhibition Atmospherics, by Asymptote founder Hani Rashid.The works presented in this important show embody Asymptote’s radical architecture practice built on hybridity and spatial explorations. All of the works in the show are linked by their shared, formal exploration of objects subjected to speed and movement such as auto bodies or aerospace prototypes. For Atmospherics, Rashid has returned to unique, geometric forms called M-Scapes, initially produced in 2001 as digital drawings and exhibited at the ICA Philadelphia. Iterations of the abstract M-Scape form have consistently been used as a building block for Asymptote’s larger concepts. These M-scapes (“Motionscapes”) further described by Rashid as “ambiguous bodies caught between the automotive body and the anatomical body,” link Asymptote’s past and present practices. With four buildings currently under construction globally in New York City, Busan, Budapest and Abu Dhabi, Asymptote finds itself in a new stage of enacting the experimental ideas at the core of its practice, in “real,” 3-D space. Atmospherics is the first time the M-Scapes have been produced as physical objects for exhibition. The large-scale M-Scapes are offered in limited edition, including Theta_03 and Theta_04 and the dramatic Baldaquin de Pury. These enigmatic forms, created from fiberglass and finished with high-gloss automotive paint, beautifully evoke forms found in both technology and nature. Theta_02, a symmetrical, abstract form with a flocked, undulating surface, invites the viewer to approach, and even physically touch, its smooth curves—bridging sculpture and object. Asymptote’s artistic engagement with technology is evidenced in a group of black epoxy vases, rapid prototypes created by a 3-D printer.With swirling, perforated surfaces, Fugu, Ubu and Roi appear as tornadoes and whirlpools in constant motion. This sense of flux carries over in a group of exquisite gold boxes commissioned by Meta (the contemporary arm of Mallett Antiques) and especially in Ivo_03, a table crafted from slumped glass placed atop an undulating sheet cut from a single block ofTula steel. Also included in the exhibition is Roulette, a spectacular room installation of white Corian pods each inlaid with a metallic groove, and the elegant LQ Chandelier de Pury arranged in large-scale configurations exclusive to this exhibition. Produced by Zumtobel in molded plastic and coated with a reflective, aluminum-infused finish, Rashid’s LQ Chandelier de Pury modernizes the chandelier’s refractory, baroque effects by using modern LED lighting. 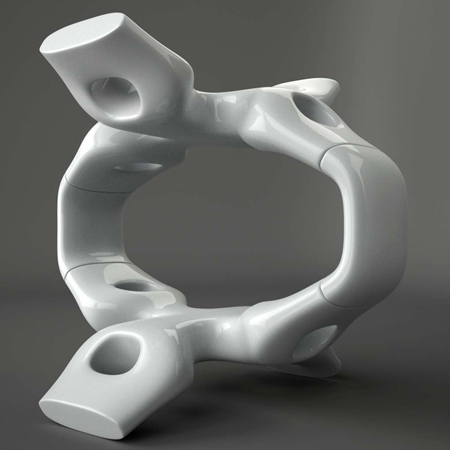 Atmospherics provokes both desire and debate: Abstract sculpture or enigmatic chair? Ornate chandelier or spectacular installation? Object of interference or object of desire? As an answer, Rashid terms the works within Atmospherics “object architecture.” Unplugged from their inception in the virtual world, and introduced into the gallery context, these objects challenge conventional delineations between creative disciplines. Because of their large scale, and their purposefully ambiguous function, these inarguably beautiful works hover between sculpture and furniture, object and building. Baldaquin de Pury is the ultimate example of Rashid’s concept. A physically impressive ring structure configured from M-Scape forms, Baldaquin de Pury is firstly a formal exploration, “a micro-architecture within a macro-architecture,” says Rashid. The object’s elusive function depends on the viewer’s perspective and whimsy.The ringed form could be an outdoor pavillion situated in the landscape, a private sleeping chamber within a bedroom, or a minimalist sculpture within a gallery. The exhibition title Atmospherics refers to the ability of these objects to act as catalysts, sensually charging their environments. Each piece in the exhibition possess the ability to both create and reflect the atmospherics of place—to absorb and transmit light, to transform the gallery space into living space, to be framed as architecture and be reframed as art. Atmospherics also refers to the emotive, phenomenological response of viewing the work and feeling solid categories shift. Asymptote, founded in 1989 by partners Hani Rashid and LiseAnne Couture, has distinguished itself in the architecture, design and art worlds with a radical practice of spatial exploration via digital technology.With research and experimentation of virtual space at the core,Asymptote envisioned new forms of 21st-Century architecture in projects such as the GuggenheimVirtual Museum (1999 – 2001) and the NYSE 3-DTrading Floor Virtual Reality Environment (1997 – 2000). Their hybrid experiments have allowed Asymptote to move fluidly between the art and architecture worlds. In a single year, Asymptote created a multimedia art project Fluxspace 1.0 Installation (2000) at the CCAC Institute in San Francisco, and the Fluxspace 2.0 Pavilion (2000) at the Venice Architecture Biennale. Following in 2002, Asymptote exhibited Fluxspace 3.0 at Documenta XI in Kassel, Germany; in 2004, Rashid and Couture were awarded the prestigious Frederick Kiesler Prize for Architecture and the Arts, in recognition of their exceptional contributions to the progress and merging of art and architecture. At a moment when art, design and architecture seem to merge ever closer, the objects within the Atmospherics gallery exhibition at Phillips de Pury, NewYork challenge us to reconsider the limits and creative possibilities of each discipline. Ultimately for Rashid, “Architecture is the provocative art of our time.” Atmospherics invites us to engage in the debate through viewing these exquisite objects of desire.